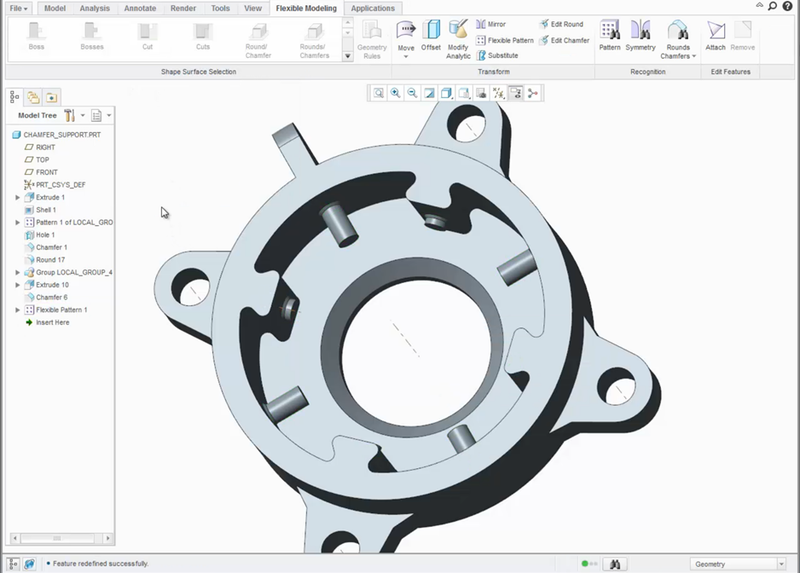 The Flexible Pattern tool allows you to leverage the round and chamfer handling capabilities of PTC Creo FMX while creating a pattern of geometry. By default, the flexible pattern tool will remove any round or chamfer attachment geometry and extend the one-sided edges of the pattern geometry until it intersects solid geometry. Then, it will recreate the round or chamfer attachment geometry. With the Attachment options, you can control whether or not the round or chamfer attachment geometry is recreated after it is removed. You can also control if the one sided edges are extended. Under References, there is an option which allows you to tell the system to treat attachment round and chamfer geometry the same as the rest of the pattern geometry. In this instance, they will not be removed and recreated. Furthermore, if the attachment option is checked, their one-sided surface edges will be extended. 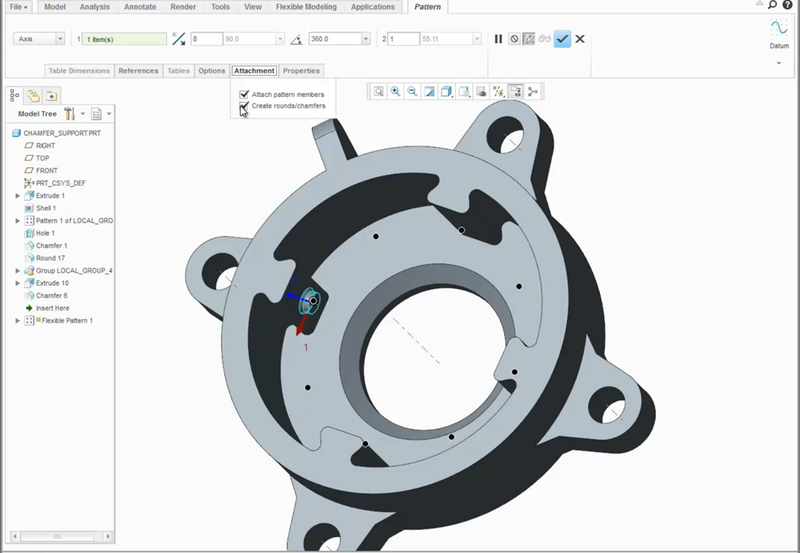 Check out our video tutorial on the PTC University Learning Exchange (“New Flexible Pattern Tool in PTC Creo Flexible Modeling”) to learn more. Stay tuned to our “Did You Know” blog series as we cover all of the exciting, new enhancements in PTC Creo 3.0. 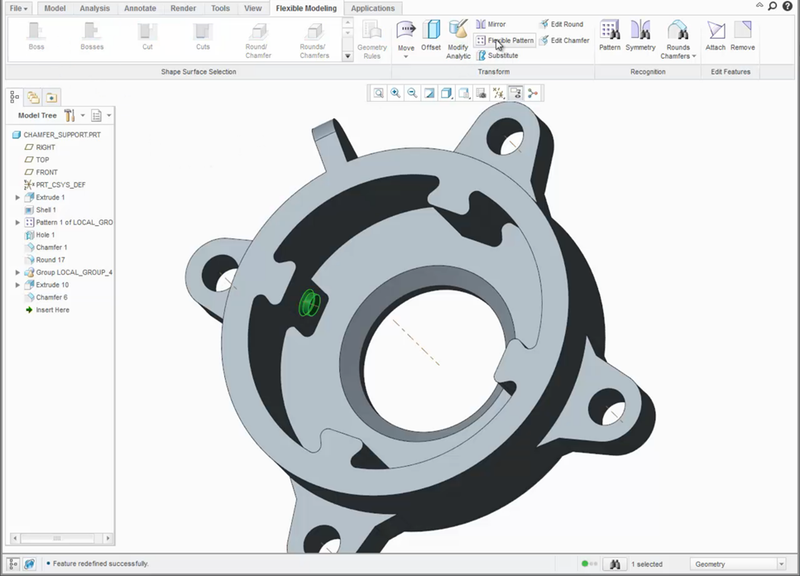 Have some ideas about what PTC Creo product features you’d like to learn more about? Send me a message or leave a comment below and we’ll write up the best ideas from the community. Thanks for reading, looking forward to all of your feedback!